Some folks say that red, white, and blue are three colors. Those people are wrong though. Combined they make only one great color, and that amazing color is none other than the color of 'MERICA. 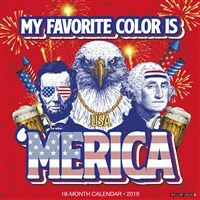 The full color, large format calendar includes large daily grids; six bonus months of July through December 2018; moon phases; U.S. and international holidays. Printed on sturdy, high-quality stock.